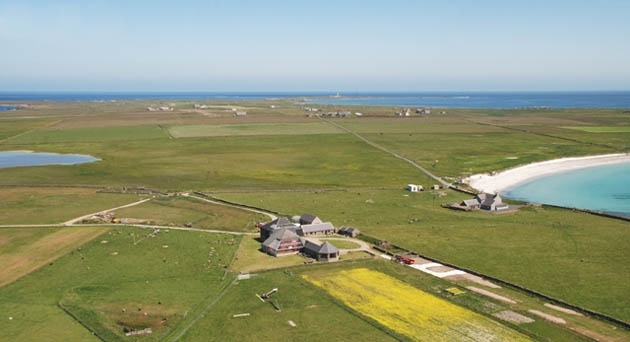 North Ronaldsay Bird Observatory offers comfortable and convenient accommodation for visitors to Orkney's most northerly island. A variety of accommodation options suit a range of budgets and catering preferences. The Observatory is also a functioning scientific field centre, with resident ornithologists present to study and record the island's diverse birdlife throughout the year. Guests are always welcome to accompany the staff of guided walks and bird ringing activities - a rare and exciting opportunity to see some amazing wildlife up close. Highlights include searching for gull and tern chicks among the colonies and ringing secretive Storm Petrels late on dark summer nights. Close encounters with seals and various interesting bird species are almost guaranteed, and there is always a possibility of Orcas on calm days. The following accommodation options are available: en suite guest house rooms, hostel accommodation and a small camping ground. Breakfast and evening meals are provided for half-board guests and lunches (eat-in or take-out) are available from the observatory cafe. Groceries are available for self-catering guests. The fully licensed bar overlooks the North Ronaldsay Firth, with views of several other islands on clear days.